The Municipal Art Society of New York (MAS) finds the alternatives proposed by the U.S. Army Corps of Engineers (USACE) for the New York and New Jersey Harbor Regional Storm and Tributaries Coastal Storm Risk Management Feasibility Study (“Feasibility Study”) to be patently inadequate as long-term protection to coastal storm risks for a number of reasons. In general, we find the USACE’s structural approach to storm resiliency identified in the Feasibility Study to be self-defeating in the battle against the effects of climate change. In the event that the massive in-water barriers are constructed, tens of thousands of properties would still face risks on a daily basis due to future tidal flooding. Despite the enormous financial investment in infrastructure, the barriers would fail to protect residents and property in the long-term and would have long-lasting, wide-spread adverse ecological consequences. 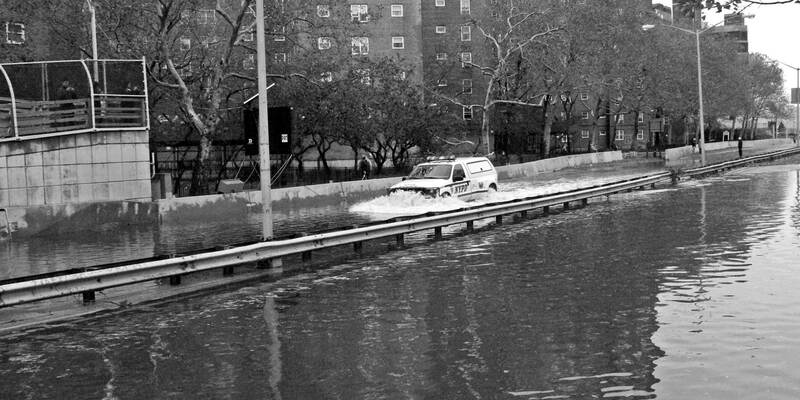 A NYPD van drives down the FDR flooded from Hurricane Sandy in 2012. Photo: Wikimedia Commons, David Shankbone. We also find the alternatives as proposed directly contradict the recommendations in the USACE’s own Hudson-Raritan Estuary Comprehensive Restoration Plan (Restoration Plan). In stark contrast to the massive structural approaches offered in the Feasibility Study, the Restoration Plan supports natural ecosystem restoration programs, increasing awareness of resiliency within coastal communities, and protecting valuable infrastructure and property against the impacts of future storms. Furthermore, for a project of this magnitude, we find the public outreach efforts and level of detail in the information provided by the USACE to be woefully insufficient. At a minimum, we expect the USACE to hold additional informational meetings with effected communities before moving forward with this project. The fact that the deadline for submitting scoping comments for the Feasibility Study has been moved twice reflects the inadequacy of the outreach effort thus far. In the aftermath of Superstorm Sandy in 2012, MAS brought together leaders, government officials, grassroots community organizers, academics, and a host of other community stakeholders and planning practitioners in a series of forums, meetings, and programs to find ways to improve resiliency in light of the impacts of climate change in the New York City area. Between 2012 and 2015, MAS organized over 25 events, which provided a robust forum for the sharing of information concerning resilience planning throughout New York. These efforts helped identify four guiding principles: transparency, collaboration, inclusivity, and scalability. MAS maintains that adherence to these principles is critical to ensuring that New York City’s resiliency efforts meet the needs of all New Yorkers. These principles and recommendations are further explained in the 2013 MAS report, All Hands on Deck: Mobilizing New Yorkers for a Livable and Resilient City. The Hudson-Raritan Estuary Comprehensive Restoration Plan (Restoration Plan) was a collaborative effort between the USACE, the Port Authority of New York and New Jersey, and the New York – New Jersey Harbor & Estuary Program that supported restoration programs designed to improve ecological conditions in Hudson-Raritan Estuary. The Restoration Plan includes non-structural methods such as wetland creation and restoration, habitat enhancements, coastal and maritime forest restoration, oyster reef habitat creation and other methods identified in the CRP. In contrast, the structural alternatives presented in the Feasibility Study directly conflict with the methods outlined in the Restoration Plan. We question why the Feasibility Study focuses predominantly on massive structures within the region’s waterways and largely ignores the ecologically sound solutions supported in the Restoration Plan. MAS firmly believes that the proposed alternatives in the Feasibility Study, particularly those that include large-scale, in-water barriers (Alternatives Nos. 2, 3A, 3B, and 4) would fail to meet the aforementioned recommendations. Although large-scale, in-water barriers would provide temporary protection against storm surges, they will not be sufficiently flexible or adaptive to address long-term sea level rise. Research conducted by the New York Panel on Climate Change (NPCC) also supports NYCEDC’s concerns. Based on the NPCC projections, as many as 43,882 properties in New York City could be affected by daily tidal inundation due to sea level increasing by year 2100 (See Figures 1 and 2). Moreover, according to NYC Department of Finance, the assessed total value of these properties for fiscal year 2018 is over $52 billion, almost as much as all the real estate in Staten Island ($63 billion) or the Bronx ($61 billion). Therefore, MAS believes that the USACE should factor the value of properties affected by sea level rise into the economic assessment, a critical component of the Feasibility Study. According to the NPCC, by year 2100 sea level could increase as much as 75 inches and storms of the magnitude of Sandy could eventually overtop the in-water barriers proposed by the USACE. Once constructed, the system of gates and walls could not be easily modified or heightened. Accordingly, we find it irresponsible to invest in infrastructure that would fail to maintain protection over a long period of time. Instead, MAS believes that onshore, adaptive levees, dunes, floodwalls, and coastal green infrastructure built and modified as needed over time, are a more rational and cost-effective alternative to purely structural resiliency approaches. Storm surge barriers, as proposed in alternatives 2, 3A, 3B, and 4, would not reduce flood risk resulting from heavy rainfall and may actually increase risk resulting from “back flooding” by limiting water flow back to waterways. As seen during Hurricane Irene in August 2011, much of the damage in New York occurred due to extreme precipitation in inland areas. According to the National Climate Assessment, the amount of precipitation falling during very heavy events has increased 71 percent in the northeast region of the U.S. Moreover, climate change will likely have a potentially dangerous effect on the water cycle. Warmer atmospheric temperatures hold more moisture, leading to even more intense precipitation events, a trend already observed in the New York region. As such, storm surge barriers could increase flooding in inland areas caused by extreme precipitation. Even though there has been significant progress in improving the water quality of New York harbor and its tributaries, the issue remains a very significant problem for New York City and for many of its surrounding municipalities. New York City has over 20 waterbodies that do not meet federal water quality standards and are currently classified as impaired by the New York State Department of Environmental Conservation (NYSDEC). Large-scale in-water barriers, as proposed in alternatives 2, 3A, 3B, and 4, will restrict tidal flow, sediment transport, and migration of fish, which will further worsen the water quality conditions. Unrestricted tidal exchange is essential for transporting sediments and flushing out contaminants. If tidal exchange is restricted, sewage and other contaminants would flush to the ocean at a slower pace, resulting in more pollution in already impaired waterbodies. Higher nutrient levels would lead to more frequent algae blooms and lower dissolved oxygen essential for aquatic life. Moreover, with more accumulated sedimentation, the harbor would require much more dredging to maintain shipping channels. MAS believes that onshore solutions such as adaptive levees, dunes, and floodwalls will not have indirect negative impacts on water quality. According to information provided by USACE, the barrier projects would cost an estimated $10 billion to $36 billion to build, and $100 million to $2.5 billion to maintain every year. The USACE has stated that maintenance and operation costs would NOT be covered by the federal government. Instead these costs will fall on local municipalities. MAS finds it unacceptable to saddle local communities with the burden of astronomical infrastructure expenditures that ultimately would still leave thousands of properties and people at risk and lead to potentially harmful impacts on water quality and marine habitat. The fact that the alternatives proposed by the USACE directly contradict the approaches outlined in the USACE’s Restoration Plan cannot be ignored. They also fail to recognize the basic principles and recommendations that a wide range of experts and citizens alike have agreed upon regarding storm surge and climate change resiliency. In many ways, the USACE is doing directly the opposite. In consideration of the magnitude of the proposed structures, the astronomical cost that communities would face, and the potential ecological destruction that could occur, MAS finds the USACE’s community outreach efforts and information provided to be woefully inadequate. We urge the USACE to move the deadline for comments until substantial additional public input is gleaned through a rigorous public outreach program and additional meetings in affected communities. Without effective community engagement, the project will fail to respond to the needs of the people most likely to be affected by the impacts of these structures, storm surge and climate change. Therefore, we urge the USACE to reconsider the proposed alternatives and engagement strategy. Thank you for the opportunity to comment on this vitally important proposal.